Alison has had a hard life, she has seen so much for someone her age, been through just as much. At times she has wanted to give up, thinking that was her only out. One night when she wanted to end it all she meet Roamyn, a man who helped her see that she didnt need to end her life, that things could get better. Roamyn like Alison has lived through some life changing situations, but he never had any answers to his issues. Alison and Roamyn meet that one night and then dont see each other again for years. 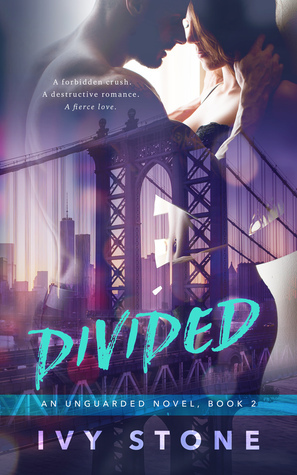 What I enjoyed most about Divided is when Alison puts her mind to something she tries her best to follow through, she wants her sister to be proud of her and she wants something with Roamyn but wants to get herself better before she puts herself out there. She lives day by day to get better from the hard life she has lead, and it isnt always easy and there will be problems along the way! But with Roamyn by her side she feels she can do anything. This book is fantastic, if you enjoy books with dangerous mafia families, dangerous situations where you have to fight for your life and to get where you want to be, some unexpected news added in the mix, a love story with a twist, and family and friends that will do anything for you, even save your life when you dont think they are even around anymore.